Kefir is a fermented milk beverage originating form one of the world’s top longevity regions. The word Kefir is derived from the Turkish work Keif which translates to “feeling good”. This fermented beverage is known for promoting healthy digestion and overall well-being*. KEFIRAN is the best of the traditional kefir drink in a veggie capsule. KEFIRAN contains no dairy, lactose or gluten. KEFIRAN is vegan and low calorie. During fermentation the L.Kefiranofaciens in traditional kefir produces kefiran, a polysaccharide that – along with the probiotic cultures – is believed to be the primary source of kefir’s health benefits. Most of the food in our modern diet is devoid of the healthy bacteria found in many traditional foods. Add KEFIRAN to your daily diet and enjoy the benefits of the traditional fermented beverage beverage for healthy digestion, intestinal health and overall well-being*. Why not just drink Kefir? Kefir drink has a sour taste and gluey texture that can be a real turn-off. Kefir drink is also an animal product made from milk and hence contain lactose. What's in KEFIRAN and how much do I take? How do I take KEFIRAN? For best results, take two capsules daily with a light meal. How big are KEFIRAN Capsules? KEFIRAN capsules are small and easy to swallow. KEFIRAN capsules can also be opened and mixed with your favorite snack or breakfast. KEFIRAN combines probiotics and kefiran polysaccharide that is made from fermented Non-GMO rice. KEFIRAN is dairy free and contains NO Lactose. 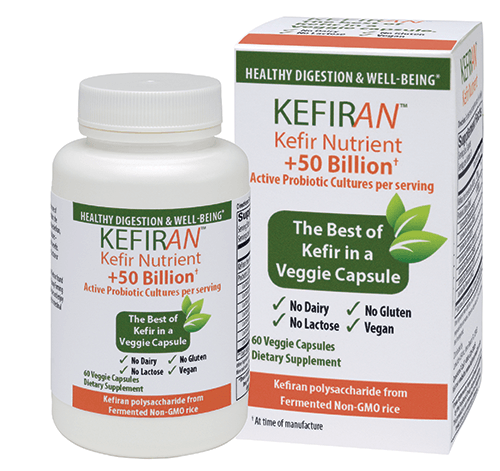 KEFIRAN combines probiotics and kefiran polysaccharide that is made from fermented Non-GMO rice. KEFIRAN is DAIRY FREE. KEFIRAN combines probiotics and kefiran polysaccharide that is made from fermented Non-GMO rice. KEFIRAN contains no gluten. KEFIRAN is produced through a simple fermentation process of Non-GMO rice. It has no animal sourced ingredient and is 100% Vegan. KEFIRAN Capsules are 100% Vegan. Does KEFIRAN need to be refrigerated? KEFIRAN should be store in a dry place at 72 F. However It is best to refrigerate KEFIRAN once opened. Can I open KEFIRAN Capsules and mix the KEFIRAN powder with food? KEFIRAN capsules can also be opened and mixed with your favorite snack or breakfast. We recommend not to cook KEFIRAN as it would kill the active cultures. Is KEFIRAN manufactured in a GMP Facility? To ensure KEFIRAN meets the highest standards of quality, strict controls are applied at every stage of the manufacturing process. KEFIRAN is manufactured in a GMP facility. How Do I Buy KEFIRAN? *These statements have not been evaluated by the Food and Drug Administration.These products are not intended to diagnose, treat, cure, or prevent any disease.